Family comedies that take a workaholic father figure and open his eyes to the world that’s passing him by through some supernatural means are a fairly common commodity, and there’s certainly nothing special about Barry Sonnenfeld’s Nine Lives, a banal domestic farce that’s painfully predictable. Plot: A stuffy businessman finds himself trapped inside the body of his family's cat. Run Time: 1 Hr. 27 Min. Family comedies that take a workaholic father figure and open his eyes to the world that’s passing him by through some supernatural means are a fairly common commodity, and there’s certainly nothing special about Barry Sonnenfeld’s Nine Lives, a banal domestic farce that’s painfully predictable. Wasting a truly first-rate cast of outstanding actors on such forgettable fluff is quite regrettable, made worse by the fact that much of it simply isn’t very funny. Consumed with the desire to build the tallest building in North America, billionaire entrepreneur Tom Brand (Kevin Spacey) has only modest amounts of time for wife number two Lara (Jennifer Garner) and child number two Rebecca (Malina Weissman) while child number one David (Robbie Amell) tries his hardest to see that all of his father’s dreams come to fruition. Behind his back, Tom’s executive assistant Ian Cox (Mark Consuelos) is trying to arrange a coup to take the Brand brand public, and when an accident during a lightning storm transfers Tom’s soul into the cat he’s just bought his eleven-year old daughter for her birthday while sending his physical body into a coma, Ian sees his chance to take over the company. Tom tries everything he can think of to get his family to recognize that their new cat named Mister Fuzzypants is actually him, but only the sorcerer who sold him Felix Perkins (Christopher Walken) can actually hear Tom’s thoughts and refuses to help him get through to his family recognizing that he needs this time to find out as much about them as he can before seeing what can be done about getting the souls transferred back into the proper bodies. With five writers on the script: Gwyn Lurie, Matt R. Allen, Caleb Wilson, Daniel Antoniazzi, and Ben Shiffrin, one might think there would be plenty of funny lines and situations, but apart from a few lame puns and some expected toilet humor and naturally plenty of cat havoc as Tom in cat mode frustratingly attempts to communicate with his loved ones any way that he can think of, the movie is fun free. The cat shop is located in a Diagon Alley-style shop housing dozens of cats of different varieties (much more interesting things are obviously going on there than in the Donald Trump-like Tower building that we keep returning to), and proprietor Felix Perkins is just eccentric and elfin enough to draw our attention every time he appears. Because the budget obviously didn’t allow for the cat’s mouth to be anthropomorphized any time Tom talks, we only hear his thoughts on the soundtrack losing potential humor of seeing these well trained cats all playing Fuzzypants mumbling out the series of putdowns and catcalls (no pun intended) to loved ones, rivals, or enemies. Cat lovers may find it all harmless, PG-rated fun, but others will likely have to work hard to even crack a smile. Performances are all over the map. Mark Consuelos plays the movie’s villain as a one-note schemer, cartoonish and without emotional colors. Jennifer Garner and Malina Weissman as wife and daughter are playing it as real as they can. Likewise Robbie Amell plays the earnest and devoted son who’s unappreciated by his dad but comes to learn of his father’s love and trust. Cheryl Hines as wife number one plays it harpyish and broad, a style which Talitha Bateman as her daughter emulates. Kevin Spacey and Christopher Walken, both Oscar winners, play more adorable parts of their natures here as opposed to the nastier, more malignant sides of human nature that they typically explore. The film’s 1.85:1 theatrical aspect ratio is faithfully rendered in this 1080p transfer using the AVC codec. It’s a first-rate transfer throughout as sharpness is excellent and reveals much detail in hair and facial features, and colors are bright and fully saturated without ever going overboard (the various greens of Walken’s suit and the blues in Spacey’s and Amell’s eyes are quite striking). Contrast has been consistently applied for a sterling result. The film has been divided into 9 chapters. The DTS-HD Master Audio 5.1 sound mix centralizes the sound mix in the front channels with only sporadic use of the rears for the background music of Evgueni Galperine and Sacha Galperine and some pop tunes. Dialogue has been recorded professionally and has been placed in the center channel. Letting the Cat Out of the Bag (12:03, HD): a behind-the-scenes look at the making of the film with brief comments from director Barry Sonnenfeld, writers Dan Antoniazzi and Ben Shiffrin, producer Jonathan Vanger, costume designer Marylin Fitoussi, production designer Michael Wylie, and actors Jennifer Garner, Robbie Amell, Cheryl Hines, Mark Consuelos, and Christopher Walken. Russian for Herding Cats (14:07, HD): despite his allergies concerning cats, director Barry Sonnenfeld along with the cat trainers brought on for the movie describe the several Russian cats who play Mister Fuzzypants in the movie including Gene who did most of the posing for the camera and Uri who did most of the fast action. Promo Trailer (HD): Ice Age; Collision Course, among others. DVD/Ultraviolet: disc and code sheet enclosed in the case. 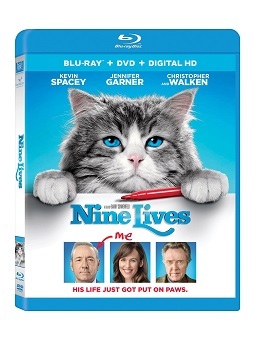 It’s difficult to make a family comedy without the comedy, but Nine Lives is certainly lacking in the jokes and wit department. A fine cast seems wasted on such pale material, but those drawn to all things cats will appreciate the reference video quality and the more than decent sound mix. Keep or boot ultra low quality members?